1. Run a basting thread through the middle of the canvas both horizontally and vertically to help with the counting. Attach to frame with tacks about every 1/2". 2. The tent stitches in this project are worked on the diagonal as shown in the stitch diagram. Use three strands of floss or metallic in your needle. Strip the threads and lay each stitch for better coverage and a smoother surface. remember is to break up your stitching into small irregularly shaped areas. Several places are stitched with 3 strands of only Ultra Very Lt. Antique Blue, for example, around the bird and to the right of the tree. You can hide the date by cross stitching it with 2 strands of Ocean Spray and working the background around it Ultra Very Lt. Antique Blue. 4. The face and legs of the baby lamb are stitched in diagonal tent stitch with Ecru. Using 2 strands of Broider Wul, fill in the lamb's body with French knots, working the outside edge first to establish the shape. A lazy daisy stitch worked in 1 strand of Impressions is used for the ear. Backstitch the lamb following the picture. A small straight stitch forms the eye. Use 2 strands of Ultra Dk. Coffee Brown for backstitching and eye. 5. Work the face, ears and feet of the mother sheep in diagonal tent stitch using 3 strands of Antique Parchment. You may find it easier to baste or backstitch the shape of the sheep onto the canvas for ease in placing your next stitches. A semi circular line on the sheep's chest also appears on the graph. 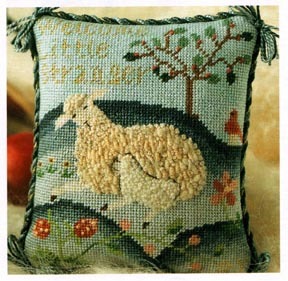 With 1 strand of Impressions # 1146, fill in the top of the sheep's head and above the semicircular line with French knots. It is better to outline each area completely with French knots and then fill in. Around the rest of the sheep's body, place French knots about every 2-3 threads to form a general shape. These French knots are Impressions # 1146 using 1 strand. Fill in the remainder of the sheep's body with bullion knots in Palomino overdyed wool, using 1 strand. Refer to picture for directional information. Wrap the needle about 7-8 times and cover 3-4 canvas threads. The empty places left after doing this, can be filled in with French knots worked with Impressions # 1146. The nose and lower portion of the sheep's face were backstitched with 2 strands of Ultra D. Coffee Brown. Refer to the picture for this. 6. Work the flowers and fruits where indicated, using diagonal tent stitch. French knots, using 2 strands of Lt. Old Gold, accent the strawberries and center of red flower. 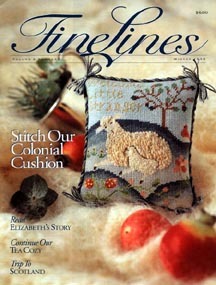 The apple tree has French knot "apples" stitched with 2 strands of Dk. Salmon. There is an apple near the base of each leaf. Refer to the picture for this. The 3 yellow flowers have centers worked with 2 strands of Mahogany in French knots. 7. The hills are worked entirely in diagonal tent stitch. Follow the graph or your own whims when shading the hills. Careful counting is definitely not a priority! 8. If desired, add your own initials in the lower right hand corner, using the metallic gold. COPYRIGHT NOTICE: These instructions and designs are provided for the personal use of our web site visitors. Any other use be it reproduced or distributed in any other form (including electronic) must have the prior written permission of The Historic Needlework Guild.